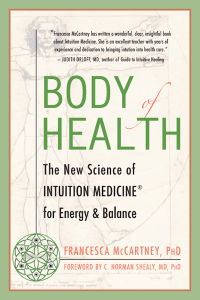 Body of Health: The New Science of Intuition Medicine® for Energy & Balance explores the science behind the mind/body connection. 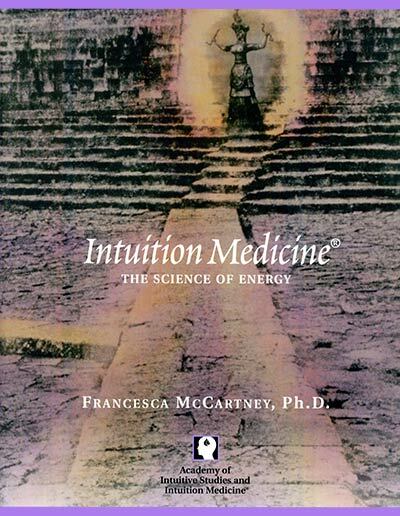 Presenting a bridge between traditional scientific thought and exciting research in energetic healing modalities, Dr. Francesca McCartney’s 2005 book addresses the important connections between mind, body, spirit, and healing. 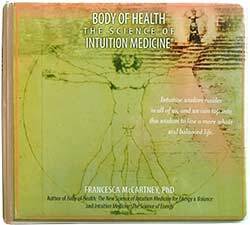 McCartney’s Intuition Medicine studies the connection between subtle energy, meditation, intuition, and health. In addition, the techniques described in Body of Health are designed to help readers explore and further their understanding of color, the chakra system, and other theories and modalities as they relate to overall improved health and healing from “dis-ease.” Working as an “intuitive” in the medical field, McCartney has helped nurses, doctors, and other medical practitioners discover the source of pain and disease while guiding patients to more effective healing therapies. “All humans generate a personal energetic field — sometimes called a chakra or aura. Like a radio antenna, we send and receive electromagnetic signals to and from the world around us. Spiritual systems and healing practices have long recognized the presence of this energy and have worked with it for well-being and healing,” she maintains. “Modern science is just now catching up with these ancient practices by inventing machines that can measure and direct bioelectric fields,” she adds. A few of the areas covered in this wide-ranging yet accessible book include aura, color, meditation, and affirmations, and their roles in healing. Each chapter examines one practice or theory of energy, and offers examples, stories, and simple techniques that readers can use to “test” the concept. Included are descriptive charts, journal writing exercises, stories from people who use this practice, cross-references to studies of the topic, and step-by-step meditations.